Why are certain places perceived to be therapeutic, to make people feel better about life, about themselves, and about their bodies? Could there be environmental, individual, societal, and attachment factors that come together in the healing process in both traditional and non-traditional landscapes? This observation is particularly important and has implications for the understanding of both healing and disruption in the lives of individuals. 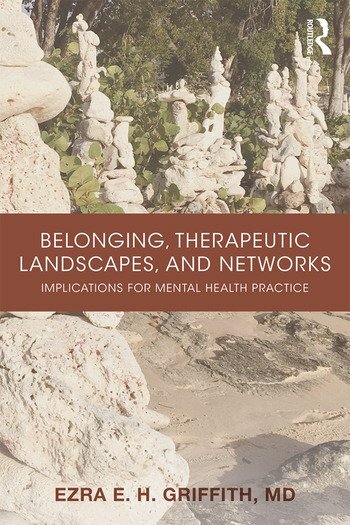 In Belonging, Therapeutic Landscapes, and Networks, Dr. Griffith examines factors that influence the intersection of health and place, one’s sense of belonging, and the constructing of therapeutic spaces that minimize psychosocial disruption in our daily lives. Dr. Ezra Griffith, MD is Professor Emeritus of Psychiatry and African-American Studies at Yale University. In 2001, the Morehouse School of Medicine conferred on him its Doctor of Science degree, Honoris Causa. Dr. Griffith has published widely, with over 140 publications of academic articles, commentaries, and books. He has also carried out significant scholarship over the years in medical anthropology. In 2010, the American Psychiatric Association presented him its Isaac Ray Award for his distinguished achievements in forensic psychiatry. He delivered the Isaac Ray Lecture at the annual meeting of the American Academy of Psychiatry and the Law. In March 2012, he was a visiting professor at the University of Florida, College of Medicine; and in September 2012, he was the Steinberg Visiting Professor of Psychiatry and the Law at the University of Rochester School of Medicine. He has been recently lecturing on medical ethics and on the organizational problems of diversity and inclusion. "This marvelous book takes us to the beach, the cathedral, the kitchen, the street, all the while chatting about the ways in which these places shape and heal us. Ezra Griffith, the distinguished psychiatrist, is, in these pages, a best friend from childhood, a confidant and confider. You will love this book for its insights and enjoy it for its friendliness! A treasure!" "Belonging, Therapeutic Landscapes and Networks is an exceptional work on a subject not often deliberated in psychiatry. Dr. Griffith extensively discusses belonging in the major areas of our lives and illustrates how important it is through storytelling, case presentations and self-exploration. He is an outstanding writer who engages the reader and is a skilled and seasoned clinician who presents and examines the clinical implications."